Jane Cooper sat by the pool in the garden of her elegant villa; soaking up the sunshine and watching her maid sweep the kitchen steps. She looked across at George the new man in her life and wondered if it would be second time lucky. She hadn’t had much luck so far. What had she done to deserve the grizzly episode that fate had directed her way? Strange, until now Jane had been able to block out the terrible events of that night. Perhaps it was a defence mechanism; her brain had excluded the gruesome details that she now recalled with such clarity. When she thought about it, the only two men she’d ever been close to had left her life in tatters. She hadn’t been married to Rupert Van Saale of course but the eighteen months spent in his house had been the most traumatic of her life. She consoled herself with the thought that he’d been instrumental in giving her a fresh start! She could recall every moment of her first wedding. Even now the events of that day raised goose bumps on her bikini clad figure. She’d been married to Richard for three years, there were no children, but they’d been happy. She’d had a network of good friends and at Richard’s suggestion Jane had settled down to the life of a suburban housewife. Things couldn’t have got much better. The faces of the two policemen who brought the news that Richard had been killed in a car crash were forever etched in her memory; Jane shuddered when she thought of that day’s devastation. For a week Jane had been grief stricken and the details of Richards’s funeral had shredded her nerves. It wasn’t until two weeks after the funeral that the lawyer arrived and gave her the news that Richard had died leaving huge gambling debts. Grief and shock had turned to disbelief and anger, when she’d seen all Richards assets sold off to pay his creditors. Jane had been left with just enough for the deposit on a small flat. Her life had gone from full to empty in the space of a month. It was her friend Sally who suggested she take the cleaning job. After the trauma of Richards death Jane had been forced to find work and the teaching career she’d pursued before she married Richard was not an option. Jane remembered the humiliation of her first day at work cleaning other people’s houses. But then something strange had happened; Jane found she enjoyed cleaning and she was good at it. There was something therapeutic about making bathroom and kitchen surfaces shine. She got a kick out of seeing her clients smile when they saw her cleaning efforts. Her boss had told her she was fastidious; she became something of a star at the company she was working for. But then she’d seen the advert! Mr & Mrs Van Saale recently arrived from South Africa seek a housekeeper/ cleaner for their newly renovated country house. Salary on offer was almost twice what Jane could earn working for the cleaning company and there was accommodation thrown in. Jane could rent out her flat. Looking back a year later Jane should have realised that she was walking into trouble. But hindsight is a wonderful thing! Jane had been taken on by Olive Van Saale; a tall, gentle timid woman who spoke with a soft Afrikaans’ accent. At the time her husband Rupert had been away on business. Jane and Olive hit it off immediately and Jane felt they could become friends. It wasn’t until much later she realised she was Olives’ only friend. It was two weeks after she started that Jane was introduce to Mr Van Saale and its then the warning bells should have rung. There was something instantly dislikeable about Rupert Van Saale. He was a short thin rat of a man; with close cropped hair a pencil moustache and front teeth that protruded. Like Olive he had Afrikaans’ accent but unlike Olive he shouted all the time. In her first few weeks with the Van Saale’s Jane witnessed the violence Rupert metered out to his staff. But the worst of his temper was reserved for Olive and it wasn’t just the shouting. Jane began to notice the bruises on Olives face and neck, the ones she tried to hide with makeup. Jane remembered the incident with the birthday card; Olive had received a card that for some reason Rupert didn’t like and the next morning Olive appeared at breakfast with a black eye. Jane didn’t see all that went on of course but she noticed that Rupert kept Olive a virtual prisoner in the house. Olive had no friends and the only visitors to the house were Rupert’s business associates. Jane did what she could; she’d take Olive to look round the local shops or for coffee in town when Rupert was away on business. But she could never get Olive to acknowledge what a brute Rupert was. Jane even suggested Olive leave Rupert. Jane found details of a local woman’s shelter that was run for “battered wives”. Poor Olive explained that Rupert was a very wealthy man and when she’d tried to leave him in South Africa his people had found her and he’d made her life even more unbearable. There were times Jane remembered, when she herself felt like leaving that miserable violent household. But then she’d think of Olive alone with a monster! The end when it came was violent. It was just after the second Christmas Jane had spent in the house and the Van Saale children had gone back to boarding school. Jane had suggested to Olive that they go to the local cinema. There was a Christmas musical on and Jane felt Olive might like to get out of the house. It was about four in the afternoon and Olive went into Rupert’s study to tell him she intended to go out with Jane. Rupert, true to form hit the roof and began shouting. He screamed at Olive telling her that she was not leaving the house with the “cleaner”. Olive retaliated and started to walk out of the room. Jane had seen the two of them through the half open door. Rupert had suddenly swung his clenched fist at Olives face and Jane had watched the blood pore out of the resulting nose bleed. Seeing Jane, Rupert had quickly slammed the door. For five minutes Jane had listened to a furious argument. She’d thought about calling the police but then there was a thud and an unexpected silence. All Jane could hear was Olive quietly sobbing. When Jane had opened the door a dreadful sight met her eyes. Rupert lay face down on the floor close to his desk. The back and side of his head was caved in and he was covered in blood. As Jane looked round there seemed to be blood everywhere. On the floor on the desk on the walls and even spots on the light shade! Olive was sitting on the arm of a chesterfield that occupied one end of the study. She was sobbing and clutching the large paperweight that normally sat on Rupert’s desk. Jane could see that Olive’s hands and the paperweight were smeared with blood. For a moment Jane had been frozen, she remembered the feeling of panic; then as if a light had been switched on she knew what to do. Jane had dashed to the kitchen and returned with two pairs of “marigolds”. She’d put on a pair of gloves and had gone over to Olive. Jane had gently removed the paperweight from Olive’s trembling hand and helped her put on a pair of gloves. With the assistance of a wheel barrow Jane had found in the garden shed the two women removed the body and put it in the passenger seat of Rupert’s car. With Jane driving Rupert’s car and Olive following in Jane’s car; they made their way to a secluded car park about five miles from the house. The two women had pushed Rupert’s body over to the driving side and driven back to the house in Jane’s car. On their return, Jane had persuaded a trembling Olive to take a sleeping pill and go to bed. 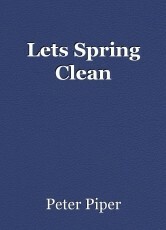 Now, let’s spring clean Jane remembered saying to herself. Almost five hours later Rupert’s study was pristine. All trace of those gruesome events had been obliterated and all the cleaning materials incinerated. Jane had even placed the paperweight in a strong bleach solution to counter any possibility of Olive being incriminated. Next morning, Jane had coached Olive through a phone call to the police telling them Rupert was missing. The three month police enquiry that followed had been the most nerve wracking experience of Jane’s life. Eventually the police came to the house and told Olive that reluctantly they were closing the case. Their enquiries had come to a dead end and there was no forensic evidence. Apparently, when they examined Rupert’s car it had been washed down with a solution of bleach and an industrial cleaning agent. All traces of who might have been at the scene had been eradicated. So thorough was the cleaning job that the police speculated that Rupert may have been professionally targeted. After that, a nervous six weeks had passed before Olive could bring herself to get on with her life. She told Jane she’d be returning to Cape Town to live with her sister. Before going she’d been anxious for Jane to accept the gift she was offering; a “banker’s draught” for a seven figure sum that would allow Jane a fresh start. I owe you everything Olive had said. Rupert’s departure had made her a wealthy woman and her gift she explained though large, represented only a small token. I can never repay your friendship and your kindness. Without you she’d said I’d have no life at all! A cloud suddenly blocked out the sun and forced Jane back to the here and now. She looked around the garden and at the magnificent villa with the maid polishing windows. She shuddered at the dark journey and human tragedy that had brought her all this. Should she feel guilty; or had she been an instrument of justice. It was a question that would haunt her for the rest of her days. You look sad said George, coming towards her holding two bottles of cold beer, a penny for your thoughts. Oh its nothing said Jane; I was just thinking; now I have a maid I may miss spring cleaning. Here, rub some suntan lotion on my back! © Copyright 2019 Peter Piper. All rights reserved. Hmm. Retaliation for a life made a living hell. An excellently told story, Peter. Thanks for reading H glad you liked it regards Peter. Thanks H, glad you liked it!